Excellent soldering iron for those who find themselves soldering a lot. This is our go to soldering iron. It turns on quickly and the temperature stays very stable which is important when using lead-free solder that is not as forgiving as its leaded brethren. 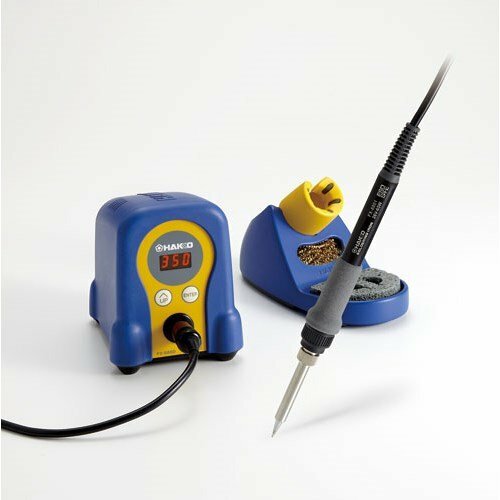 Reliable digital technology by HAKKO – Introducing the HAKKO FX-888D Excellent thermal recovery Heater output has been increased by 30% compared to that of the conventional models HAKKO 936·937. Also FX-888D delivers excellent thermal recovery by using T18 series tips for their terrific heat conductivity. This allows soldering at a lower set temperature and reducing the thermal impact on components as well as tip oxidation that can shorten tip life. Thermal recovery graph Rise time to 350Degree C is 20 seconds faster and tip temperature drop is reduced during continuous work.